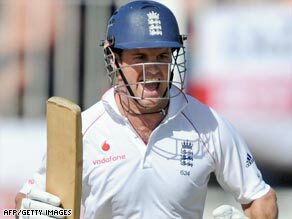 (CNN) -- Captain Andrew Strauss struck his 17th Test hundred, and third in consecutive matches, as England dominated the opening day of the fifth and final Test against West Indies at the Queen's Park Oval, Trinidad -- a match they have to win to avoid a series defeat. Strauss has been in unstoppable form, making his third successive century in the West Indies. Strauss finished unbeaten on 139 to lead the tourists to 258 for two on a slow pitch against some negative tactics from West Indies, who fielded just three frontline bowlers and drafted in an extra batsman in a bid to avoid defeat. This latest effort arrived after four hours 20 minutes at the crease when he steered a delivery from opposite number Chris Gayle into the off-side and scampered through for a single. Earlier, Strauss' opening partner Alastair Cook was dismissed for 12, undone by a beauty from Daren Powell which pitched on off-stump, forcing the left-hander to edge behind to wicketkeeper Denesh Ramdin. Next in was Owais Shah, but the batsman had to retire hurt on 29 because of severe cramp in his hands, in a repeat of his Test debut in Mumbai three years ago. That brought Kevin Pietersen to the crease for his 50th Test appearance. However, the former captain's stay did not last long and he perished for just 10, bowled through the gate by left-arm spinner Ryan Hinds. But that was the hosts' last success of the day as Paul Collingwood (54no) joined Strauss in putting on a century stand to wrap up a convincing day for England.